Resists chair movement when weight is on the caster. Most often used for added safety on work stools (e.g., drafting chairs). Soft tread protects hardwood and tile floors. 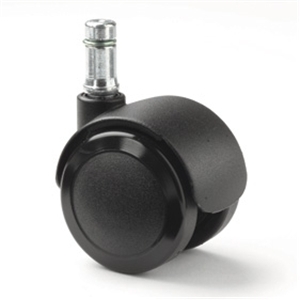 Reverse Braking Casters resist chair movement when weight is on the caster. Most often used for added safety on work stools (e.g., medical, drafting, factory and dental stools) that are higher than typical chairs. Soft non-marking, non-abrasive tread is safe on hardwood and tile floors. The casters do what they are designed to do, but on a hardwood floor, they slide easily when locked, which is just as bad as rolling. Maybe they will work better on carpet. Internal breaking casters are designed to lock only when you are sitting in the chair. The caster wheel lock may not engage if you weigh less than 110 pounds.